Last night’s Yod in a client’s chart – urgent hospitalization. A yod is a malefic aspect. It’s formed when two planets form a sextile and then both form a quincunx with a third planet. From the point of view of geometry, it’s an isosceles triangle. In this article I’m going to look at a yod involving Transit Saturn, Progressed Moon & the New Moon. A year ago I wrote my new book, the result of practicing astrology for over half a century – Breaking the Prophetic Code “The Cosmic Key to Astrological Prediction: It’s Dead Serious”. I came upon a most astounding revelation as I was going through a major health crisis in my life. Although I realized that my methods of prediction were far above average and astoundingly accurate most of the times, there were some exceptions and deviations from expected results. Using the progressed Moon and New Moons were accurate but, at times, seemed to miss the mark. The book uses a technique that uncovers the secrets to accurate predictions of events in one’s life and the actual application of this technique to the charts of celebrity deaths, be they famous or infamous. From John F. Kennedy’s assassination to the suicides of Aaron Hernandez and Robin Williams suicide, Steve Job’s death, Joan Rivers unfortunate demise at the hands of a anesthesiologist,to Ben Ladin death at the hands of the Navy Seals, and many more. A must read for any serious astrologer. 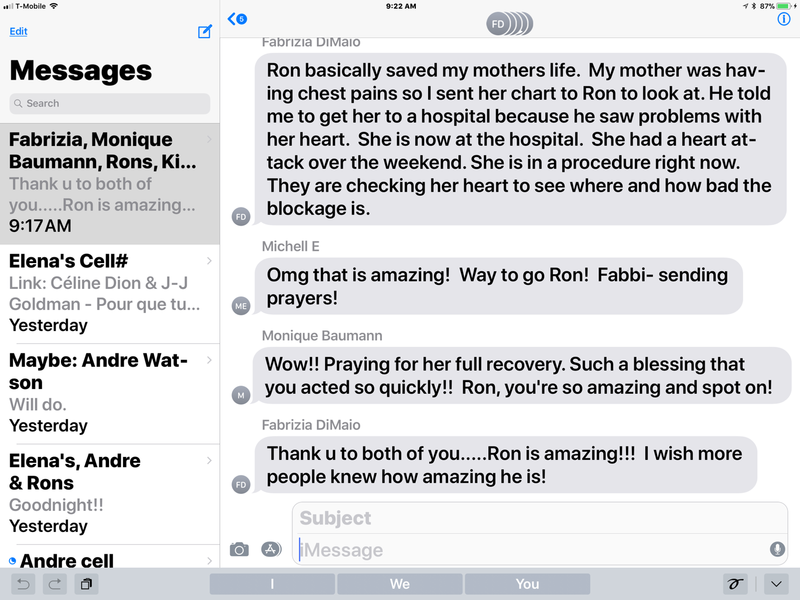 Since death of celebrities is a highly publicized and recorded event the use of these examples proves the efficacy of my technique and its repeated accuracy time and time again – yet again last night with one of my client’s mother who lived in another state. In “The Cosmic Key” I share my technique – three simple calculations, which go against almost all modern astrological conventional opinions. As an astrologer, it is not my ethic to tell someone when I see death, but it often presents itself with this technique when the alignments are set up. There could have been potential in the life of Robin Williams had he had the council of a good astrologer prior to his suicide. A good astrologer could have forewarned J.F. Kennedy before his trip to Dallas. Last night yod that I saw in one of my client’s mother’s chart resulted in an urgent hospitalization, as I had no choice but to warn the daughter that if she waited, she might not be able to see her mother the next day. Her mother had locked herself in her bedroom when the mention of going to a hospital was entertained, but when told that I had predicted dire circumstances and death if she didn’t comply (as I had done most of her family’s charts in the past, and she regarded my astrological counsel highly). Upon arriving at the hospital, the doctors discovered she had experienced a heart attack and that three major arteries were blocked, and the main artery was not pumping blood at all. We are currently waiting to see what the prognosis is and what intervention will be taken by the surgeons. For the astrologically savvy reader I will simply say the three witnesses that accurately predict events in one’s life were all pointing to this potentially death dealing situation. 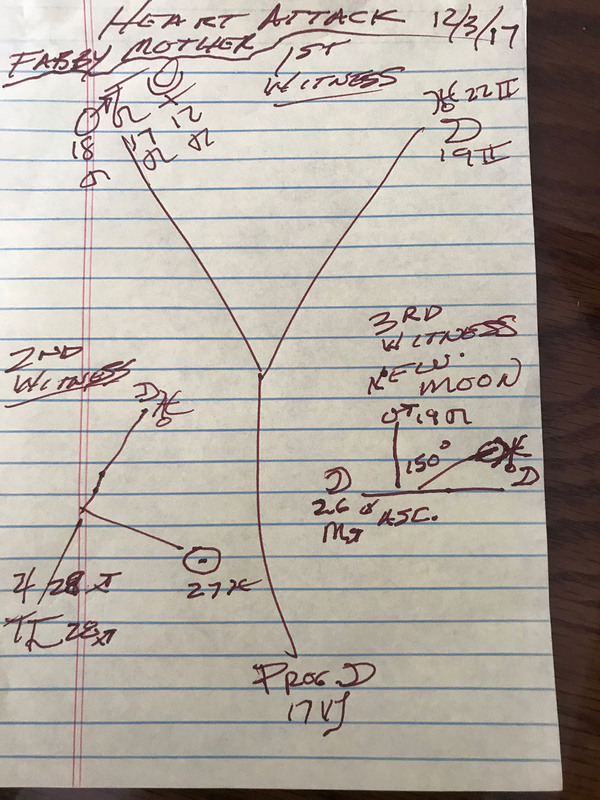 The Progressed Moon, the first witness, was exactly lined up in a YOD to Mars/Saturn/Pluto conjunction in her chart while the other side of the Yod the Moon/Uranus were perfectly aligned in what is often referred to as the “Finger of God“ aspect. The second witness is Transit Saturn which was conjunct her natal Jupiter and setting off an opposition to her Moon/Uranus and squaring her Sun exactly. The most dangerous aspects that indicate a danger to the life is when both the lights are afflicted (Sun & Moon). You’ve heard the expression: “I’m going to put your lights out,“ implying that I’m going to take your life. 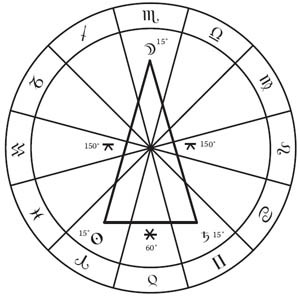 Finally, the third witness was the New Moon, which fell directly on her ascendant in her chart squaring Mars/Saturn and making a quincunx (part of a YOD) aspect to her Moon/Uranus. My book (available on Amazon) entitled The Cosmic Key to Astrological Prediction, by yours truly, shows the potential fatal effects of these YOD aspects. If you want to learn the technique, I highly recommend you acquire a copy of the book. I might add that the power of astrological advise to thwart an imminent death is of paramount importance, as this is not the first time I’ve been able to prevent a death by my counsel.